Bronchitis means that the tubes that carry air to the lungs camera (the bronchial tubes) are inflamed and irritated. When this happens, the tubes swell and produce mucus. This makes you cough. Acute bronchitis usually comes on quickly and gets better after 2 to 3 weeks. Most healthy people who get acute bronchitis get better without any problems. See a picture of acute bronchitis camera. Acute bronchitis caused by an infection usually starts with an upper respiratory illness, such as the common cold or flu (influenza), that spreads from your nose and throat down into the airways. Acute bronchitis does not affect the lungs like pneumonia does. Pneumonia shows up on a chest X-ray, but acute bronchitis usually does not. It is important to distinguish acute bronchitis from chronic bronchitis. Acute bronchitis usually lasts less than 10 days. However the coughing can continue for several weeks after the inflammation has cleared. Chronic bronchitis can last for several weeks and usually comes back. Acute bronchitis is usually caused by a virus. Often a person gets acute bronchitis after having an upper respiratory tract infection such as a common cold or the flu. In rare cases, acute bronchitis is caused by bacteria. Acute bronchitis also can be caused by breathing in things that irritate the bronchial tubes, such as tobacco smoke, chemicals and air pollution. It also can happen if a person inhales food or vomit into the lungs. 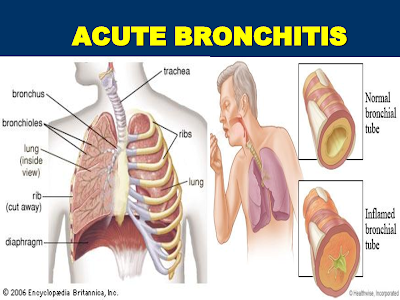 The symptoms of acute bronchitis are not specific. They mimic symptoms of other conditions such as chronic cough, chronic bronchitis, postnasal drip, and pneumonia. Therefore, acute diagnosis must always be diagnosed by a doctor. The majority of people with acute bronchitis are contagious if the cause is an infectious agent such as a virus or bacterium. People are usually less likely to be contagious as the symptoms wane. However, acute bronchitis that is caused by exposure to pollutants, tobacco smoke, or other environmental agents is not contagious. In some cases, the doctor may take a chest X-ray to make sure that you don't have pneumonia or another lung problem. If you have a fever, most physicians will recommend taking aspirin, ibuprofen (Advil, Motrin and others) or acetaminophen (Tylenol) to reduce fever. However, aspirin should not be given to children under age 19 to avoid the risk of Reye's syndrome, a rare but serious, potentially fatal illness that can occur when a child with a fever takes aspirin. If bronchitis is caused by a bacterial infection and doesn't get better on its own, an antibiotic may be prescribed. Antibiotics will be given only when there is a strong suspicion that the bronchitis is caused by a bacterial infection. That's because of rising concerns about antibiotic resistance, in which bacteria evolve in ways that allow them to survive antibiotics. This problem is increasing and is caused, in part, by antibiotics being used incorrectly and when they are not needed. There is no way to prevent all cases of acute bronchitis. However, the risk of bronchitis and complications can be reduced by not smoking and by getting flu shots to reduce the risk of getting the flu, which can lead to acute bronchitis. Home remedies may help reduce acute bronchitis symptoms. For example, staying well hydrated by drinking fluids, breathing humidified air, and avoiding dairy products as well as may keep secretions thin and more easily removed. Alcohol and caffeine should be avoided as they can interact with some of the ingredients of OTC cold preparations. Over-the-counter cough suppressants and cough drops can help reduce coughing symptoms and NSAID's and/or acetaminophen (Tylenol and others) may reduce discomfort (aspirin, especially in children and young adults is not recommended due to the risk of Reye's syndrome). However, before trying these at home, read the labels to be sure they are safe for you to use. In addition, avoiding air pollution by staying indoors, by avoiding tobacco smoke and other environmental bronchial irritants may reduce symptoms. If symptoms worsen, see your doctor. For children under age 2 (and some doctors recommend under age 6), the doctor should be consulted before OTC medicines are used.